For half a century, Tony Iommi's ominous guitar riffs propelled the dark, apocalyptic sound of Black Sabbath. Now the high priest of heavy metal has taken his music in an unexpected direction — to church. 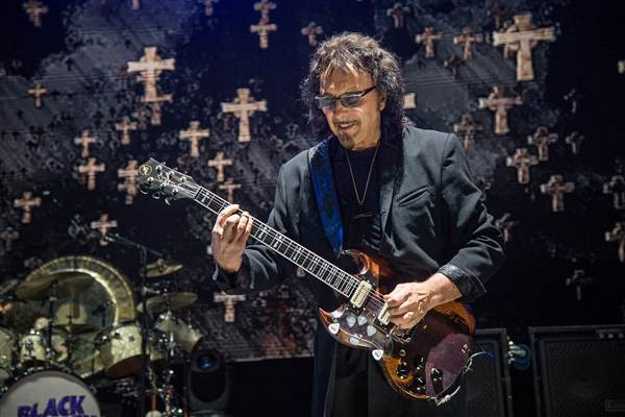 Instead of the Satanic imagery that figured in so many Sabbath songs, Iommi has drawn inspiration from The Bible — specifically Psalm 133 — to produce a haunting choral composition called "How Good It is" that he wrote specifically for the cathedral in his hometown of Birmingham, England. But when asked if he had gotten religion after all his hell-raising years, the 69-year-old lapsed Catholic who often used religious icons onstage chuckled. "It really wasn't anything to do with religion," Iommi told NBC News. "I don't follow any religious path…religiously. It just seemed like a nice thing to do. It was really nice to work with a choir and to do something for our city." And while working with a boys choir may seem like a radical departure for a musician whose best known songs like "Paranoid," "Sweat Leaf," "War Pigs" and "Sabbath, Bloody, Sabbath" featured the spooky vocals of Ozzy Osbourne, Iommi said writing religious music for the Birmingham Cathedral "was not really off the wall for me." In less well-known Sabbath songs like "Supertzar," Iommi said he used orchestration and a choir to "take the music to a new level." "I enjoy the challenge of doing something most people wouldn't expect from me," he said. 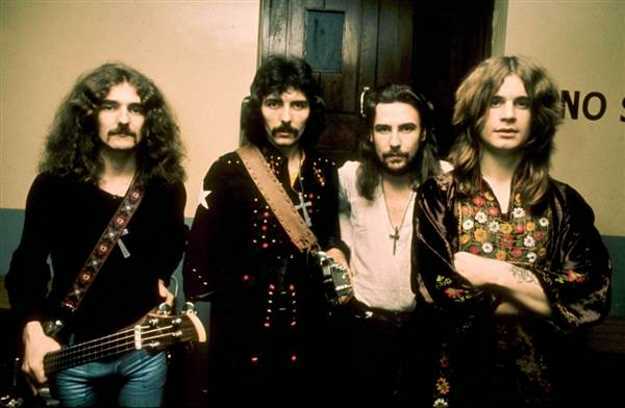 Iommi, Osbourne, and their bandmates Geezer Butler and Bill Ward, all grew up in and around Birmingham, a still gritty industrial city that is now one of the most diverse in Europe and home to large populations of Jamaican, Pakistani and Polish immigrants. Himself the son of Italian immigrants, Iommi grew up in a family where the favored instrument was the accordion, not the guitar. And his career was nearly derailed just as it was starting when he accidentally chopped off the tips of his middle and ring fingers on his right hand while operating a machine at his day job in a factory. Iommi, who is left-handed, compensated by fashioning homemade thimbles out of plastic bottle caps for his injured fingers and tuning his guitar down to make the strings easier to bend. In doing so, Iommi came up with Sabbath's signature heavy sound and ushered in a whole new type of rock music. "It's brilliant," Iommi answered when asked how he feels about being called the inventor of heavy metal. "I'm very proud that I've been able to do something that's become very popular." But heavy metal wasn't what the Very Reverent Catherine Ogle had in mind when she approached Iommi about making some beautiful music as Black Sabbath was embarking on its final tour, which ended in February with a concert in the city where they launched their career. "You two should get together and have a chat," Iommi recalled his pal Mike Olley telling him, when he broached the idea of a sit down with Ogle. "Be a nice idea to do something together for Birmingham and the cathedral." Exhausted from touring and from an arduous but ultimately successful battle with lymphoma, Iommi said he was ready to for a change of pace. "Don't get me wrong, I love playing with Black Sabbath and I'm still involved in the Sabbath thing," he said. "But this was a chance to do something different." And as he and Ogle were speaking about the proposed choral piece, "I sort of could hear the thing in my head." "I knew was that I would not write anything with really heavy riffs," he said. "The idea was to record it in the cathedral." So Iommi, who still lives in Birmingham, returned to his home studio and recorded the music coursing through his head. "I put an idea down, sent to the reverend, she really liked it and that was it," he said. 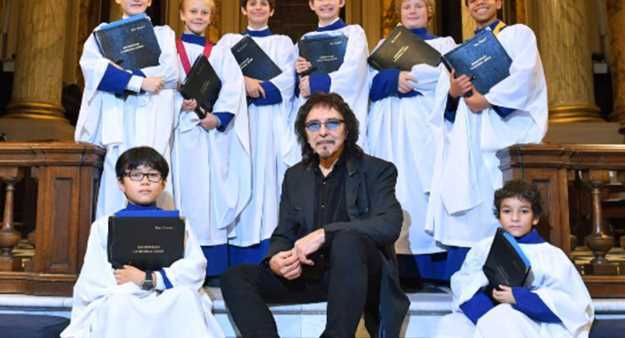 It would be another nine months before Iommi, who plays acoustic guitar on the track, was able to record the piece with the choir and cellist George Shilling. It was played in public for the first time at the cathedral in January. "This is a most wonderful gift Tony offered to the Cathedral," Ogle told The Birmingham Mail newspaper. "He has a huge fan base in the city." Iommi said his touring days may be over, but he still wants to keep making music. "I'm certainly not retiring from playing and doing stuff," he said. "But I think since my illness I've had to look at things differently, think sensibly. I feel fine, but I still go for checkups and tests and at the moment I'm okay." He's written a piece for the long-running "CSI" television series and he's in the process of mixing the sound from the final Sabbath shows in Birmingham for a possible live album. "We'll actually be doing a documentary," he said. "My job at the moment is to have a listen to what we've done." Iommi says he also he says he has "bags" of riffs he came up with for Black Sabbath that might one day wind up on a solo album. Asked what he has been listening to of late, Iommi said it hasn't been Black Sabbath. "You can't listen to the stuff you play all the time," he said. Iommi said of late he's been tuning into the vintage rock and roll from the 1950's and 1960's that first influenced him as a musician and confirmed a British newspaper's report (which apparently shocked some self-respecting Sabbath fans) that he is fond both of Doris Day, who had her heyday in the 1950s, and the soft-rocking 70s duo, The Carpenters. "That got blown out of proportion," Iommi said with a laugh. "I love heavy rock, but I don't sit and listen to heavy rock because I do that." Iommi said it's not the first time his musical detours have surprised Sabbath fans. "I'll never forget I was driving through Hollywood and I had some Frank Sinatra on, because I like Frank Sinatra," he said. "I was at the light and another car pulled up and the people inside looked over and recognized me and then realized what I was playing. The look on their faces…."